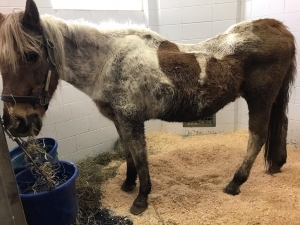 This poor gelding came to MHARF from a late March 2019 Fillmore County humane case. He is in his mid to late teens and is extremely emaciated. He was taken directly to Anoka Equine Veterinary Services where he spent the next two weeks receiving rehabilitative care and veterinary treatment. He has now been moved to a great foster home where he will continue his rehab. It is likely he will be adopted by his foster home once his rehab is complete. You can find links to the media coverage of this humane case on our Home Page. We will have updates photos soon!